This is one of the first pictures of Lucy and while we are on the subject of babies I will tell you a little story. 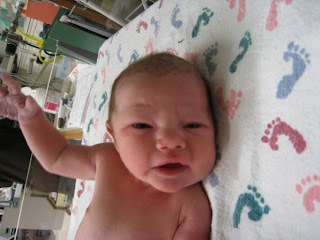 This week my sisters sister-in-law and my friend Audrey had her baby, Miss Lila Grace Coble. After seeing Lila in the hospital I came home and told Jonathan I was ready to have another baby. We also saw triplets in the nursery and I actually came home and told Jonathan I wanted triplets. I was up two nights in a row with a sick baby. Lucy had a double ear infection and she was miserable. She had a fever of 101.1. All she wanted to do was be held. The miracle was I realized I didn't want to have a baby for a while. I'm not ready for all the all nighters again which were totally exhausting. Could you imagine triplets? I thought the same thing about wanting another baby .... for like a second and then I thought naw.....ha! This post is cute! !